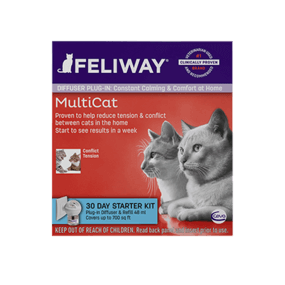 NON-RECOGNITION AGGRESSION in bonded litter-mates is the most unexpected, horrible experience, but can be solved in 8-days with FELIWAY MultiCat Diffusers!!!!!! :-)We brought a friend's kitten into our living room for an hour while our 2-year old sibling cats were sleeping in another room. After the kitten left, Bro & Sissy walked upstairs to check out the new smells. Bro plopped down on the sofa where the kitten had been, then walked over to Sissy who was smelling the rug. Sissy leaned her nose close to her best pal in the whole world since the day they were born, and within 3-seconds, she pulled back, HISSED and went ballistic on him! We were absolutely shocked since we had never seen her act aggressively. We reassured her that it was her sweet brother and no cause for "Stranger Danger", but she acted like she'd never seen him before & proceeded to chase and attack the intruder inside her house! We were heartbroken; we Googled and called the vet, because no matter how we tried to calm her and reintroduce them, she resumed her uncharacteristic attack-mode against Bro. 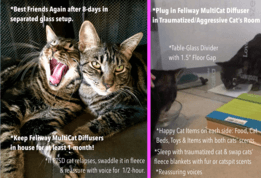 On Day 3, the FELIWAY Multicat Diffusers (recommended by internet & vet) & we plugged in twice as many as suggested for our home's square footage. We also created a separate bedroom divided by a large table-top glass propped up on books to allow a 1.5" floor gap. Finally, on Day 6, our PTSD cat finally quit hissing at her Bro. So she was allowed out of room but with close supervision for about 30-minutes, 2x or 3x a day. On DAY 8....she was back to normal and allowed her Bro to groom her. She licked him back on Day 10. (A month later, we brought the soaped & scrubbed kitten carrier into the house for only 2-minutes, but Sissy relapsed & hissed at Bro., so we tossed it & swaddled her in fleece for 30-minutes.) WHEW!!!! What an ordeal!!!!!! !